This is an Equipment Maintenance Contract which is used between the Client who owns an equipment, and a contractor who will provide the services of maintaining the equipment belonging to the client. The agreement outlines the various details that are to be kept in mind by the contractor while servicing and maintaining the equipment. It is recommended that you read each clause in this agreement and amend or modify it according to your own requirements. All the equipment under this maintenance contract will be inspected and repair on a regular basis according to the equipment maintenance manual supplied by the manufacturer. The contractor will respond to all of the client’s requests for emergency repairs within a given set amount of time after receiving the request. All the services provided under the terms and conditions of this agreement have to be performed by properly trained, certified professionals. All the employees that will maintain the client equipment have to be legally eligible to work in the United States and have comply with all Federal and State wage and employment laws and any other applicable laws and regulations. In return for the services provided by the contractor client agrees to pay the contractor a set amount on a set day of each month for the duration of this contract. The client will also have two pay the contractor for any individual required repairs performed by the contractor. For any and all the required parts, supplies and other materials necessary to properly maintain the equipment in good working order, the client will have to reimburse the contractor in accordance with the invoices given by the contract. You the client will pay each invoice received within 30 days of the stated due date. Both the client and the contractor agree upon a set date of expiration for this contract, at which time either the client contractor can extend this term if they so wish. Both the parties have the right to terminate this contract at any time by giving a written notice of termination with at least two weeks prior notice. Any litigation between the client and the contractor will have to be fired and tried in the contractor’s local jurisdiction. This contract is owned by the laws of this date and the county in which it is being executed and any other applicable federal law. Both the client and a contractor need to sign and date this agreement for it to be legally valid. 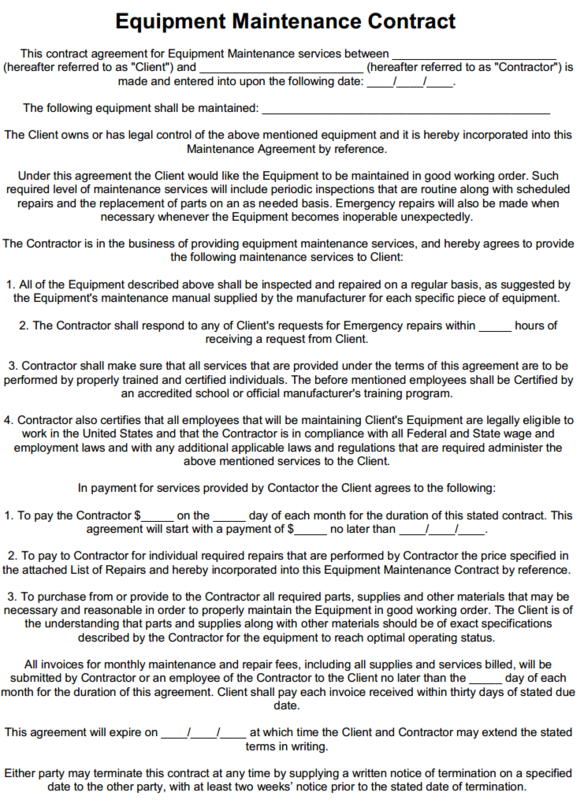 You can download this equipment maintenance contract template by clicking on the download link below.